An office refurbishment can be a large investment for your company, so it’s important to get it right the first time around. Sounds daunting, but with a little know-how and forethought, you can produce a project that runs smoothly and is enjoyable. If it’s your job to breathe new life into an old office space, then you’ll be wondering where to start. You’ll also need help coordinating the effort required to deliver the project on time and in a way that satisfies your boss, shareholders, employees – basically, anyone who has an interest in the space. Ask Yourself: Why you are Planning an Office Renovation? Either your current interior is dated, off-brand and bland, or it no longer meets the needs of your modern business. Now that you know why you’re renovating an office space, it’s time to go into more depth as to what your new office needs to deliver. Will you be utilising hot desks for flexible working hours or use a one-desk-per-person model? Additionally, will open working spaces be an advantage in encouraging spontaneous collaborative working? Are quiet spaces needed for delicate tasks – such as client phone calls and meetings or number crunching? Flexible spaces that adapt to the needs of colleagues – both physically and emotionally – will allow your company to perform at its best. If an employee feels that they are trusted to use a quiet space and have the option to do so, they will perform the task they need to do professionally and quickly, many studies have found. Will you organise departments into teams for better communication and will the furnishings reflect this arrangement? Will an open space work best or will different departments be more productive if office internal walls divide them? What hardware will you need for the company to work most effectively? Consider lighting, plug sockets, usb ports, wifi and server rooms. Are your company brand colours necessarily the best option? Will you instead take advantage of colour psychology to create a mood or tone for the office? For example, any mood can be created using a certain palette such as as relaxing, energising, creative or a professional mood. This is a crucial consideration that is all too often overlooked. Taking future-proofing seriously will mean you invest wisely and get the best bang for your buck. Think about the number of staff you currently employ and your forecasted growth. Will staff numbers increase significantly? If this is the case, you’ll want to consider moving to a larger premises. Does technological innovation mean that you’ll be employing less staff in the future? In which case, you can use more of your current space to allow for future developments. Many healthy businesses are looking to move to a larger office. If this is the right move for your business, check out our current article ‘How to choose the right office space for your company’. Here, you’ll find tips and tricks for making an informed decision with regards to relocating an entire business. 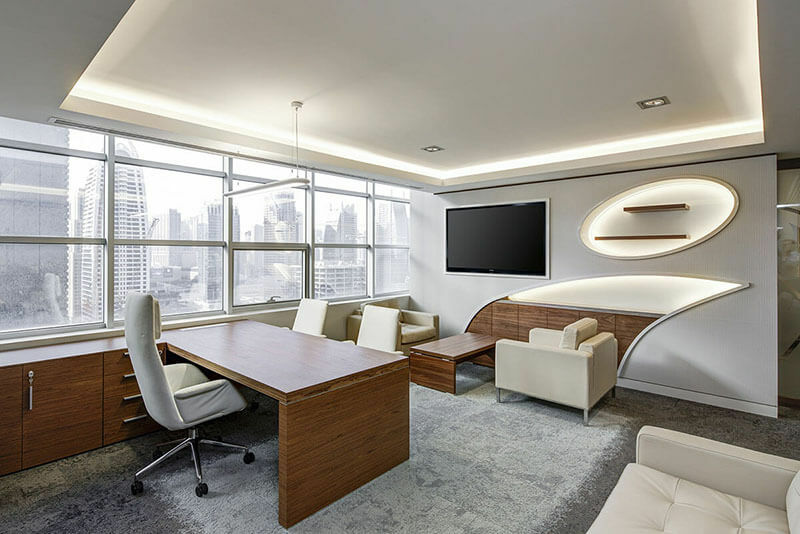 Whatever you choose to do, help from office interior design professionals will make your ideal office a reality. Be sure to choose an experienced company that offer a comprehensive service from start to finish. Spectrum Interiors is a premier office refurbishing company with years of experience in helping businesses express their unique brand with cutting edge interior design. Our knowledgeable team offer a turnkey service from consultation through to design and implementation. By the end of our process, you’ll have an office space to be proud of and one that will have clients coming back for more. Contact our team and we’ll be happy to begin transforming your space today.